First post – an intro motivating knitr in writing your manuscript and a comparison of knitr to Word options. Second post – setting up a .RProfile and using a custom.css file (current post). Third post – getting your plots the way you want. Fourth post – generating tables (current post). Fifth post – summary and example. Everything is wrapped within the main document, the <html> corresponds to the grey area. 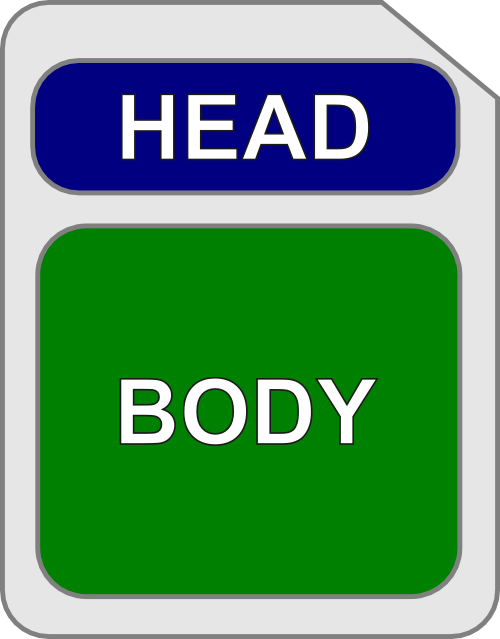 Subelements to the <html> are the <head> and <body> elements. The <head> contains meta-data not shown in the document and the style sheet should be defined within this area. The <body> contains the actual text with all the paragraphs, tables, and images. I’ve found that <sup> </sup> for superscript is very convenient although markdown has a shorthand for this ^ where you write 106 as 10^6. 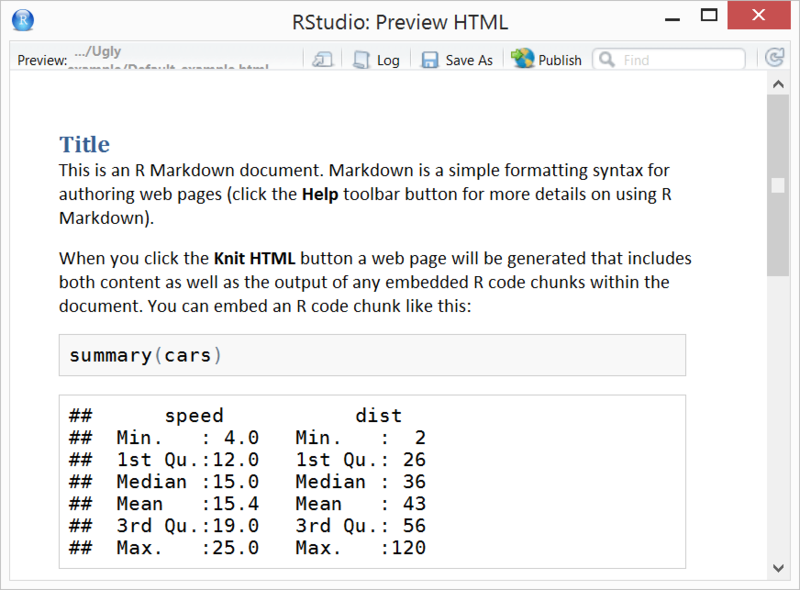 Perhaps more useful is subscipting <sub> </sub> with that currently doesn’t work as intended in default RStudio markdown (H~2~O does not translate into H2O while H<sub>2</sub>O does, note that the H~2~O works with Pandoc). This entry was posted in R, Tutorial and tagged ftp, knitr. Bookmark the permalink. Thank you for sharing the example. I like Pandoc and I commented on it in my intro, it is definitively useful but due to it’s limitations with table design I don’t use it. As far as I understand it Pandoc skips any advanced HTML. I definitely agree the default CSS style needs improvement. Frankly, I do not quite like it, either. Perhaps we will change the default style in the future. Thanks for this great series (and right when I need it!) It’s great to see this process streamline better and better. 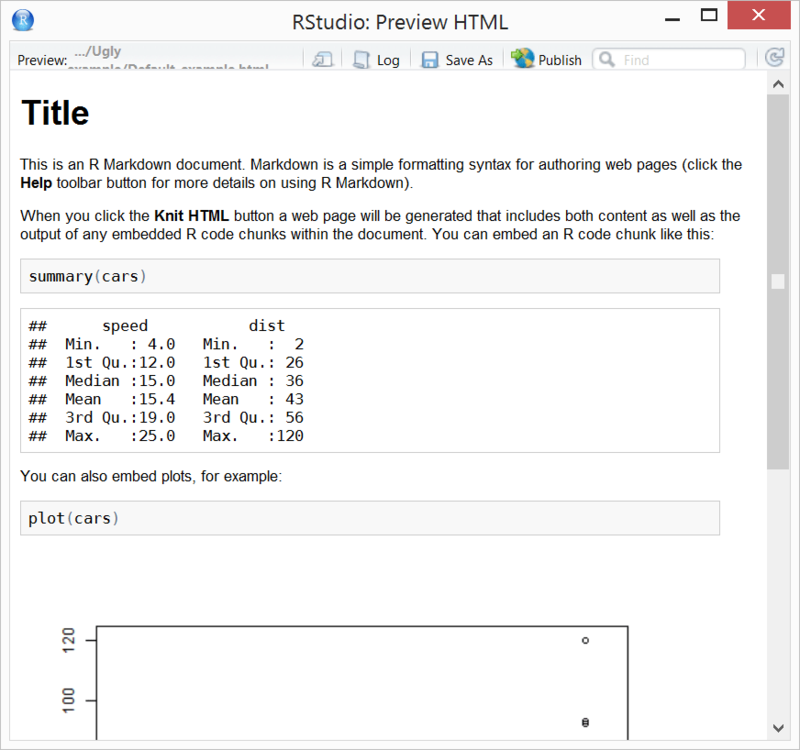 – You can make a project specific .Rprofile in the folder of the project. – Remember to re-open the project for this to take effect. Thanks for this Max, and thanks O & Y for also sharing some examples. Yihui, can the Linear Docco style elements can be read and implemented (effectively cut and paste) into a css file? That example addresses many of the elements that don’t please my eye in either the default css or MG’s MS word leaning one. I don’t think Yihui automatically receives e-mail updates from my blog. That said I would suggest that you use Firefox with the Firebug-plugin. Through that you can inspect each elements CSS-properties, tweak it to your liking and then update your CSS-file accordingly. Note though that the FTP-concept is partly about being able to import your document into a word-processor and these have serious limitations in their CSS-capabilities. You may need to take that into account. thank you for this very useful article. Helped me to feel better with knitr. Just a hint for your readers: If anybody does not succeed with .RProfile, he shoul try .Rprofile. Thank you for the wonderful tutorial. It has helped the visual appeal and readability of my knitr documents a lot. One thing I was not able to figure out is how one can adjust the “white space” (margins?) in the CSS file. I’m talking about the L and R margins that are too wide for my taste (especially with figures). I played around with the CSS margin: statement to no avail. Thanks! This has been on my todo-list for a while and since 2 min. back you can do it in the 0.1.2 version. Use the “css_max_width” parameter, e.g. css_max_width: 80em. Nice! But 0.1.2 version of what ?